Use this combination pinless moisture meter/ thermal hygrometer to capture all ambient conditions as well as moisture levels in one meter. Measurements include: Relative Humidity, Air Temperature, Grains per Pound (GPP), Dew Point, Vapor Pressure, and non-contact surface temperature with the built-in IR Thermometer. External Pin Probe, Hammer Probe, Deep Wall Probe, and Baseboard Probe are also included for contact moisture readings. USB Datalogger records 16,000 readings of Relative Humidity and 16,000 readings of Temperature and has a USB interface for easy setup and data download. Included software calculates Dew Point and GPP (grains per pound). Supplied in a rugged hard carrying case. The TK430 is a True RMS Multimeter and Clamp meter kit. Ideal for electrical testing needs including installation and repair of electrical systems, HVAC equipment and large appliances. Includes: Model EX430: True RMS, auto ranging multimeter with 11 functions. MA200: 400 Amp Clamp meter with basic AC Current and 1mA resolution. 40130: Non-contact voltage detector (from 100 Volt to 600 Volt AC). Complete with test leads and Type K bead wire temperature probe. Supplied in convenient storage case that provides protection and organization for meters and accessories. The MA620-K is an Industrial DMM/Clamp Meter Kit that includes an MA620 TRMS 600 Amp AC Clamp Meter with built-in non-contact Voltage detector. An EX505 industrial grade, CAT IV-600 Volt, 11 Function DMM that's waterproof (IP67) and drop proof (6 feet). Complete with test leads, Type K thermocouple bead probe with banana input adapter, and a magnetic hanging strap for the multimeter. Supplied in a CA900 soft carrying case that provides protection and organization for the meters and accessories. The MA640-K is ideal for Plant Maintenance. 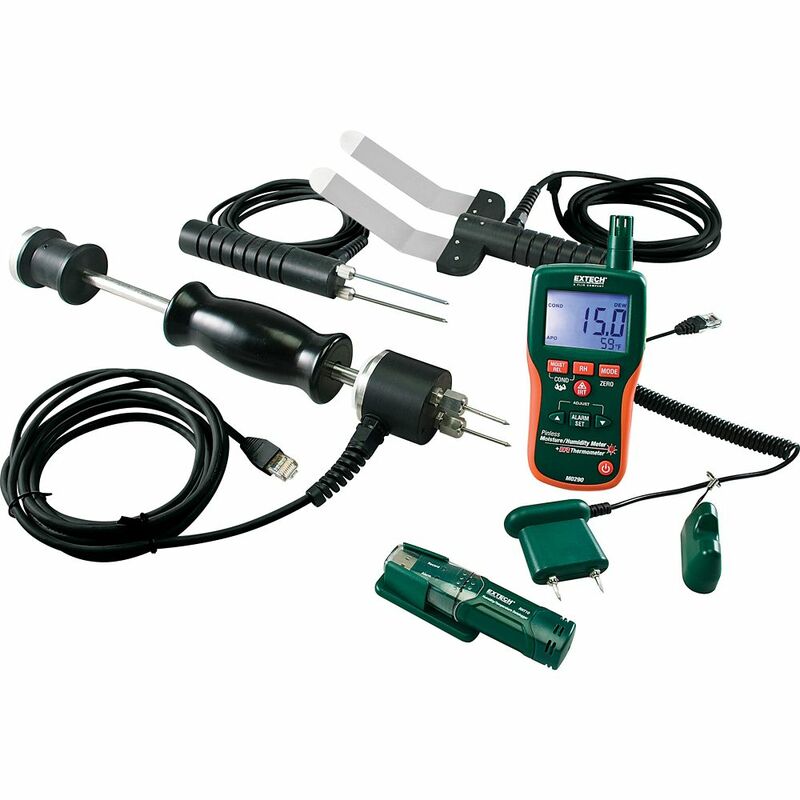 The kit includes: a True RMS Clamp meter, a 3-phase Rotation Tester, and a CAT IV AC Non-Contact Voltage Detector. The MA640 TRMS 600 Amp AC/DC Clamp Meter has a 6000 count display and advanced measurements features including Capacitance, Frequency, Duty Cycle, and Type-K Temperature. The 480400 Phase Rotation Tester with multi-line LCD has easy-to-open wide-jaw alligator clips and a durable double-molded housing. The DV25 Dual Range NCV Detector with audible and visual indication has a built-in flashlight. Kit is supplied in a CA900 carrying case that provides protection and organization for the meters. The 380976-K is an AC Power Clamp and test lead kit that measures 1- and 3-phase true power (kW), apparent power (kVA), and reactive power (kVAR), plus horsepower (HP), power factor, and phase angle with lead/lag indicator, high resistance tests to 100MOhms, type K, switchable, temperature to 1000 degree Fahrenheit, diode and continuity tests and auto power off with disable feature. Clamp meter has a 1.6 in. (40mm) jaw opening. In addition, this kit includes 2 CAT IV 72 in. test leads, 2 modular test probe handles, 2 plunger activated jaw clips, and 2 extra-large alligator clips. Complete with test lead kit, Type K probe, carrying case and 9 Volt battery. Water Restoration Contractor Kit Use this combination pinless moisture meter/ thermal hygrometer to capture all ambient conditions as well as moisture levels in one meter. Measurements include: Relative Humidity, Air Temperature, Grains per Pound (GPP), Dew Point, Vapor Pressure, and non-contact surface temperature with the built-in IR Thermometer. External Pin Probe, Hammer Probe, Deep Wall Probe, and Baseboard Probe are also included for contact moisture readings. USB Datalogger records 16,000 readings of Relative Humidity and 16,000 readings of Temperature and has a USB interface for easy setup and data download. Included software calculates Dew Point and GPP (grains per pound). Supplied in a rugged hard carrying case.